Hello, I forgot my windows 10 admin password and use the use account, but I was not allowed to install the mcafee on my win 10. So, is there any way to recover or reset my windows 10 admin password, I don't wanna re-install the system due to there are many business files on the computer. Everything worked beautifully until the last step it is telling me the user name could not be found. So it wont take the new password. You sure you have the correct user name? Really this should be asked in the win 10 Microsoft forums as they are the experts in this. Incidentally the business files are they in the user documents folder or elsewhere on the PC? If the latter maybe look up making a new admin account. Again MS forums best choice. Was it not shown here? Any admin accounts shown at all? Once done you can clear the password from the Admin account and set a new one. If that link doesn't help post in that thread on the Windows 10 Forums asking for help. Don't worry - until 3rd party software is installed (McAfee) you are still protected by Windows Defender and Windows Firewall. For advanced users, Ophcrack or NTPASSWD, which requires command prompt interaction. The former uses rainbow table to brute-force the password and the later just simply edit the windows registry. P.S No matter which program you are using, it is recommended to format the usb drive with FAT32, or there are boot errors on certain computers. 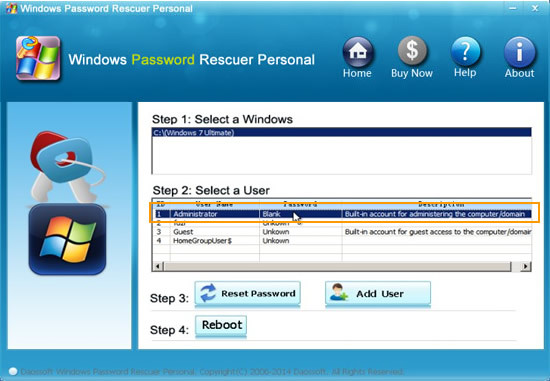 If it's a Microsoft account, you can reset the password via Microsoft password reset page. Or remove the hard drive and connect it to a working PC as slave, backup your files and then do a clean reinstallation. Thanks as this thread is 1 month old I have marked this as answered and locking the thread.